Under the patronage of Asrab Al-Yamam private school, the trainer Duha Fattahi presented for the first time "the making of the creative child" course. The course lasted for 3 days, talking about creativeness where the trainees had a better view about the concept of creativity and creative thinking; its relation with smartness and educational achievements. They were Also being acquainted with motivation, components, and stages of creativity, in addition to knowing the right, positive upbringing of the creative child. Finally, they ended by knowing the creative skills and techniques with its practical impacts on the child. The trainees were teachers and mothers, mostly from Jableh, aiming to develop children's creativity, and they wished if this course could be more than 3 days because it was a great and useful experience. Trainee Zahra'a Ghalawanji: The quantity of the raised topics, the way of delivering them, the communication between the trainer and the trainees were the best of the course since it taught us the way of changing from inactiveness to activeness, from receiving to delivering, and from copying to creativity. Trainee Khadijah Kassam: The course uplifted my thinking level, my self-assessment, and motivated my sense of creativeness. 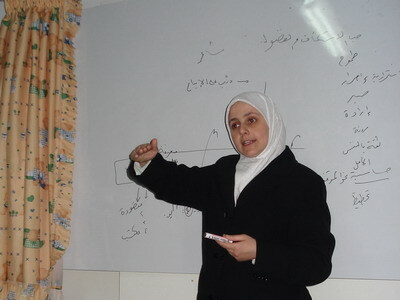 Trainees would like to have the trainer in their city, Jableh, to present training courses there. Set up by trainer Duha Fattahi, "The making of creative child" was the first session of the course.